An introduction to indigenous literary writers and writing from around the world with particular emphasis on the Canadian and North American context. 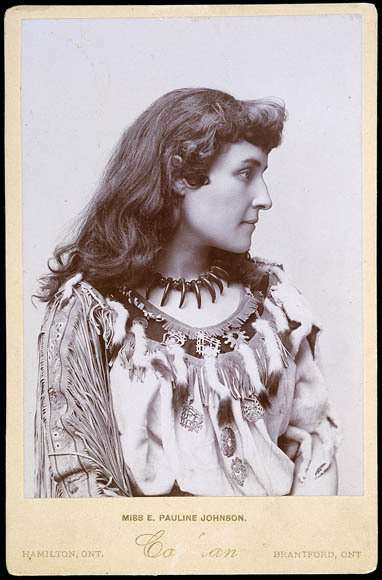 On left: E. Pauline Johnson photograph circa 1895 by Cochran from Library and Archives Canada, Online MIKAN no. 3194762. 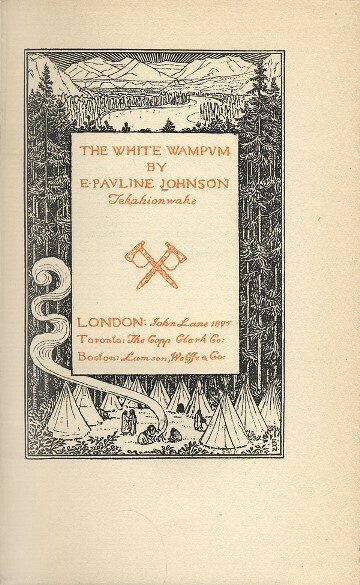 On right: Title page of Johnson's first volume of poetry, The White Wampum, published London: John Lane, 1895. Starting with a definition of indigenous peoples as the original or natural inhabitants of a country or region, one may describe indigenous literature as literature produced by original or native peoples and their descendants. Literature can take many forms: poetry, drama, fiction and creative nonfiction. Memoirs and autobiographical writings are of particular importance as a form of nonfiction that can provide cultural context for the interpretation and understanding of indigenous literature. When the English Dept. at Ryerson University developed the lower level undergraduate liberal studies course ENG 203 The Literature of Native Peoples, it was decided that it would focus upon contemporary literature by Aboriginal / First Nations / Indigenous peoples from Australia, Canada, New Zealand and the United States of America. This research guide will likewise focus on these geographic or national regions. Additionally, the focus will be upon works published in the English language. Language evolves. The tools that libraries use to describe, classify and index material also evolve but rarely manage to reflect the most current terms or ways of thinking about a subject. Terms acceptable to one person or group may be offensive to another. Terms may be assigned specific parameters by legal definition or in thesauri that guide usage in a particular tool such as prescribed list of subject headings for cataloguing purposes, notably Canadian Subject Headings and Library of Congress Subject Headings. Library and Archives Canada proposed changing some subject headings for Aboriginal peoples in Canada in 2007 and was unable to find a consensus. This is explained in a brief posting called "Update on subject headings for Aboriginal peoples in Canada." For a brief overview on the evolving nature of terminolgy, consult the Terminology page from the University of British Columbia's Indigenous Foundations website. In this guide, I will suggest ways to find information using terminology employed in the tools currently in use in Canadian academic libraries. Please do not take offense if a descriptor or phrase is archaic or less than ideal. As of 2016, the Ontario Human Rights Commission prefers to use indigenous peoples to describe peoples in Ontario, including status, non-status, First Nations, Métis and Inuit peoples. The Ryerson Faculty Association is considering the term indigenous as its preferred choice but discussion is ongoing. The Government of Canada has a Ministry of Indigenous and Northern Affairs that appears to like the terms First Nations, Inuit and Métis to describe three categories of Indigenous/Aboriginal peoples in Canada.The ministry's website continues to utilize earlier forms of its name, notably Aboriginal Affairs and Northern Development Canada (AAND). The federal government has statutes that apply many different terms as illustrated by the following examples: Indian Act, Department of Indian Affairs and Northern Development Act, and, First Nations Land Management Act. Additionally, the federal government distinguishes between "Status Indians" and "Non-status Indians."